Canada with its capital Ottawa is located in North America (Northern North America, bordering the North Atlantic Ocean on the east). It covers some 9,984,671 square kilometers (slightly larger than the US) with a population of 35,623,700. English, French and Inuktitut are the languages spoken by people in Canada (consider regional differences). Did you know that United States is the only bordering country. Canada is the second largest country in the world and the largest in North America. Canada is a land of vast distances and rich natural beauty. Economically and technologically, it resembles its neighbour to the south, the United States, although there are significant differences between the two countries. Trying to distill the climate of Canada into an easy-to-understand statement is impossible, given the vast area that this country occupies. Much of southern Ontario has a climate similar to the northeastern United States. Visiting Canada all in one trip is a massive undertaking. Over 5000 kilometres separate St. John's, Newfoundland from Victoria, British Columbia. There are many cities in Canada, all of which are distinctive, welcoming to tourists, and well worth visiting. All potential visitors, whether applying for a temporary resident visa or requesting landing permission at the border must be of good moral character, and under Canadian law this means having a completely clean criminal history. Immigration authorities take character concerns of visitors very seriously and any offence, misdemeanor or felony, regardless of how minor or how long ago it took place can exclude you from Canada for a period of time, indefinitely, or permanently. English and French are the only two official languages in Canada. In some parts of the country, April and May mark the beginning of Canadian music festival season. Yellowknife in the Northwest Territories celebrates spring with the Cariblues Festival, Halifax showcases chamber music with the Scotia Festival of Music and Ottawa highlights concerts, flowers and history at the Canadian Tulip Festival. The terrain is mostly plains with mountains in west, lowlands in southeast. The average density of population is about 4 per km². The climate in Canada can be described as varying from temperate in south to subarctic and arctic in north. Possible natural disasters include continuous permafrost in north is a serious obstacle to development, cyclonic storms form east of the Rocky Mountains, a result of the mixing of air masses from the Arctic, Pacific, and North American interior, and produce most of the country's rain and snow east of the mountains and the vast majority of volcanoes in Western Canada's Coast Mountains remain dormant. To reach someone Canada dial +1 prior to a number. The local cellular networks are operated on 850 MHz, 1900 MHz, 3G, 4G. Websites typically end with the top level domain ".ca". If you want to bring electric appliances (e.g. battery chaarger), keep in min the local 120 V - 60 Hz (plugs: A, B). The sign for the locally used currency Dollar is CAD. 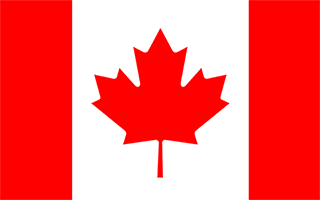 Two vertical bands of red (hoist and fly side, half width) with white square between them; an 11-pointed red maple leaf is centered in the white square; the maple leaf has long been a Canadian symbol.